A wide body on a small compact car. 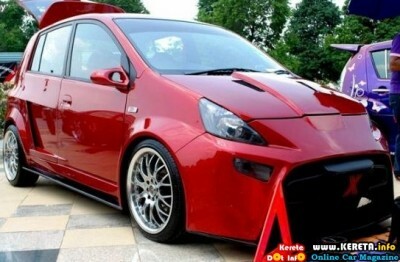 This modified Perodua Viva in red has all the complete set of custom bumper and skirting. When we talk about wide body, for sure this Viva needs some spacer to add the width of wheel track or the owner needs a wide rims to fit in the wide fender. Added spacer will give bad effect on your car handling and safety. The modified viva follows a bit of design characteristic from Evo X from the front. There is Ganardo Side mirror to add some sporty look from the outside. In actual fact, modifying your car dimension is illegal as stated by JPJ. But, whatever it is, wide body looks really cool. Rear part with diffuser, double tail pipe. -custom widebody side spoiler with diffuser.